Donald B. Corner is a practicing architect and member of the College of Distinguished Professors of the Association of Collegiate Schools of Architecture. He has been recognized for research and innovative teaching in building construction and detailing. For the past 20 years he has offered an integrated course in the technology and design of the building enclosure. Jan C. Fillinger is principal of STUDIO-E Architecture, a certified passive house consultant, an educator, and a developer of sustainable projects in Eugene, Oregon, USA. His academic and professional design work focuses on reducing carbon emissions, through socially and environmentally conscious strategies, climate- and site-responsive buildings, and urban high-density projects. 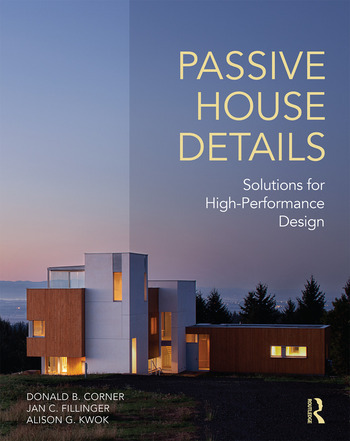 Alison G. Kwok, PhD, is an architect and certified passive house consultant. She teaches design studios, building performance seminars, and environmental technology. Her research includes adaptive and mitigation strategies for climate change, thermal comfort, and building performance case studies. She is co-author of the Green Studio Handbook and Mechanical and Electrical Equipment for Buildings.